Beyond Rannerdale Knotts, which appears to split Crummock Water in two, lie the twin peaks of Mellbreak. Beyond that are Gavel Fell, Blake Fell and Carling Knott. 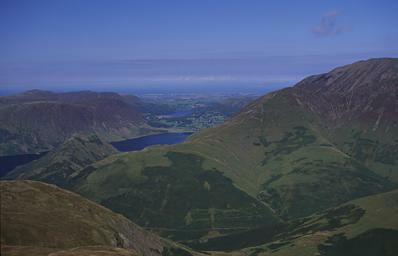 Whiteless Pike appears to the right of the picture, with Third Gill prominent as a rift in its flank. Darling Fell is in the distance, just to the left of Whiteless Pike. Larger version of this picture.